Welcome to the first geisha school which opens its gates to the public. You will watch the classes as an observer. 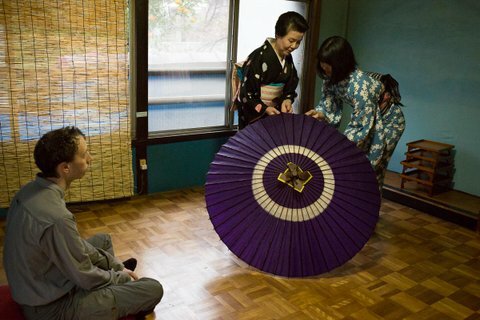 Normally, in the first hour the trainee geisha will learn from a dance teacher with more than sixty years dancing experience, or from a senior geisha. In the second hour the geisha will practice their latest performance pieces together. If the teacher is not available that day the geisha will be learning from each other or practicing together. The geisha will usually be dressed in normal kimono for their lessons but if they have a banquet directly afterwards they may be in white makeup. You will be in a Japanese-style tatami mat room and sitting on the floor so tight jeans or short skirts may not be comfortable. You will enjoy a full two hours of astonishing and absolutely unique entertainment you won’t experience anywhere else. At the end you can take pictures of and with the geisha, asking her questions and small talk. The host of this event is fluent in English and Japanese and will be pleased to translate your questions and the answers of the geisha to you. Please also keep in mind that by experiencing this activity you will automatically support the geisha business. By doing so you help by preserving an important part of Japanese culture. This activity includes no transportation nor any kind of food or drinks and free for kids from 0-10 years.